But they've nearly all been sold. That's because the owner of the basement moved out of state to an apartment, and didn't have room for all the machines. This page is still here to show what can happen to a basement when someone's wife is too lenient with her husband's hobbies. 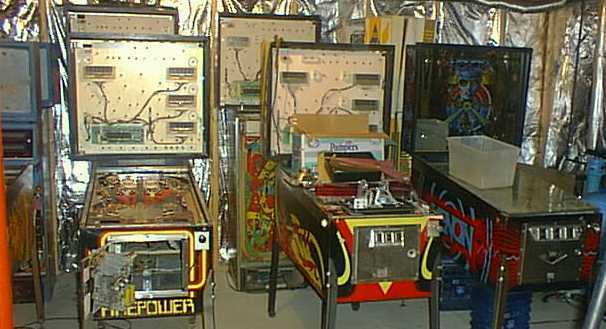 Firepower II (WMS '84), Taxi (WMS '88), Mr/Ms Pac Man (BLY '82), Firepower (WMS '80), TriZone (WMS '79), and Xenon (BLY '80). We've got two of several titles, hoping to make one good machine out of two near junkers. Here's another view of the Mr/Ms Pac Man (two), Firepower (two), TriZone (two), Xenon, and two copies of Big Ben (WMS '75 EM) behind Xenon. We've got the backglasses for all these in storage out of harm's way. 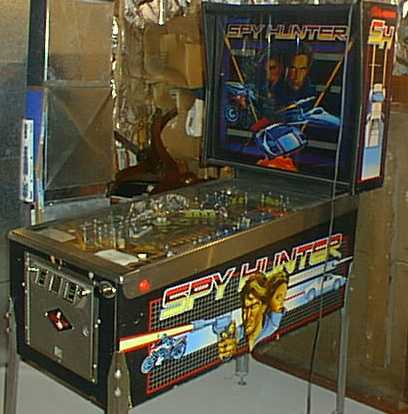 Spy Hunter (BLY '84) all by itself on the other side of the room. And there's an Earthshaker (WMS '89) and Cow Poke (Gott '65 EM) not shown here... plus a United Nugget EM shuffle bowler. It was too big for a photo, even with a wideangle lens. But here is a page with a scan of the original advertising flyer. At our other (less spacious) facility we have a Juke Box (CCM '76 EM) being worked on, plus a working Shadow (BLY '95), and Medieval Madness (BLY '98). Other games we've had in the past that have moved on to better places include Twilight Zone (BLY '93), No Good Gofers (WMS '98), Phoenix (WMS '78), Funhouse (WMS '91), Rocky & Bullwinkle (DE '93), Fishtales (WMS '92), Back To The Future (DE '90), Star Trek (BLY '78), Apollo 13 (Sega '95), Comet (WMS '85), Target Alpha (GOT '76 EM), and Stingray (STN '77). Where do we dig up these gems? 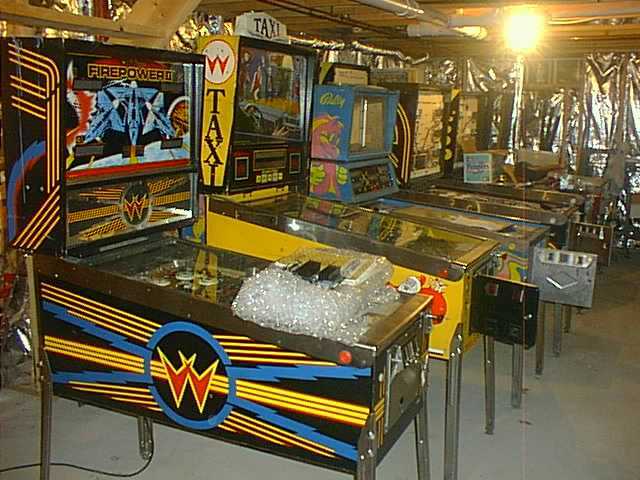 Many of them were from our yearly trips to the White Rose Pinball Classic in York PA and the spring pinball show in Allentown PA. More came from local pinheads in Mechanicville NY and Bennington VT. Occasionally a garage sale comes through, and in the case of No Good Gofers, we sometimes buy a game new in the box right from the factory (what a treat!). Why so many? Well, we're not really sure. Probably two or three working machines would be enough for any reasonable household, but it's an addiction. Just don't ask our wives about it. It's severe enough to affect other parts of normal life, like choice of a new car.